Activation Types define the different activations that are available for a customer from your service provider. Examples are New, Upgrade, FlexPay Monthly, Prepaid, Option Only, etc. Activation types are necessary for tracking commissions from your service provider. To access Activation Types from the menu bar of the main TeleTracker Online screen, click Master Files, then Activation Types. 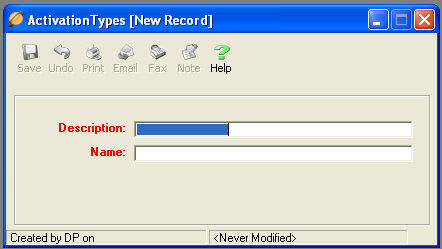 To create a new Activation Type, click on New button located on the toolbar. To open/edit an existing Activation Type, select it from the Activation Type Master File list and click the Open button. Description: Provide a brief description of the Activation Type. Name: Assign a name to the Activation Type. The Activation Types will correspond directly with your Service Provider Setup and configuration. There is an unlimited number of Activation Types that you can create.